When choosing a Western kitchen knife steel choice is never a topic. When using a Japanese kitchen knife you notice how much difference a high quality steel can make. Handmade Japanese knife makers still very much use carbon steel as it offer great performance advantage over stainless steel. In most cases the carbon steel is sandwiched between layers of stainless steel to offer impact protection and rust protection. This cladding of the core steel is what the call San Mai construction. This means the main portion of the blade is stainless and only edge or core steel needs to be wiped and dried after use. 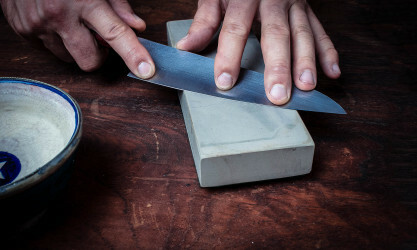 Knives made with high amounts of carbon take a really sharp edge and can hold them for longer. This is the main benefit of making knives out of carbon steel. Stainless steel Japanese kitchen knives have the advantage of being more carefree, maintenance free. Stainless steel offers a better corrosion resistance but it is still not 100% rust free. Even stainless steel can develop rust spots if exposure to moisture over a long period of time. There are also steels that combine the best of both such as modern powder metallurgy steels or exotic steels. These steels have high content of carbon like the best of carbon steel and enough chromium to make them stainless. These steels are complicated to produce, difficult to forge and thus more expensive. A fine example is R2 steel or also called SPG2. Which has 1.4 Carbon content and 15 chromium well above the 11% threshold to qualify for stainless steel. Takamura and Yu Kurosaki are knife makers who have several series of Japanese chef knives made with R2 steel. You could say that the difference is performance versus Maintenance in simple terms. But in reality you have to factor in cutting feel, ease of sharpening, cost and esthetics. The hardness level is also a factor in edge holding capacity and ease of sharpening.